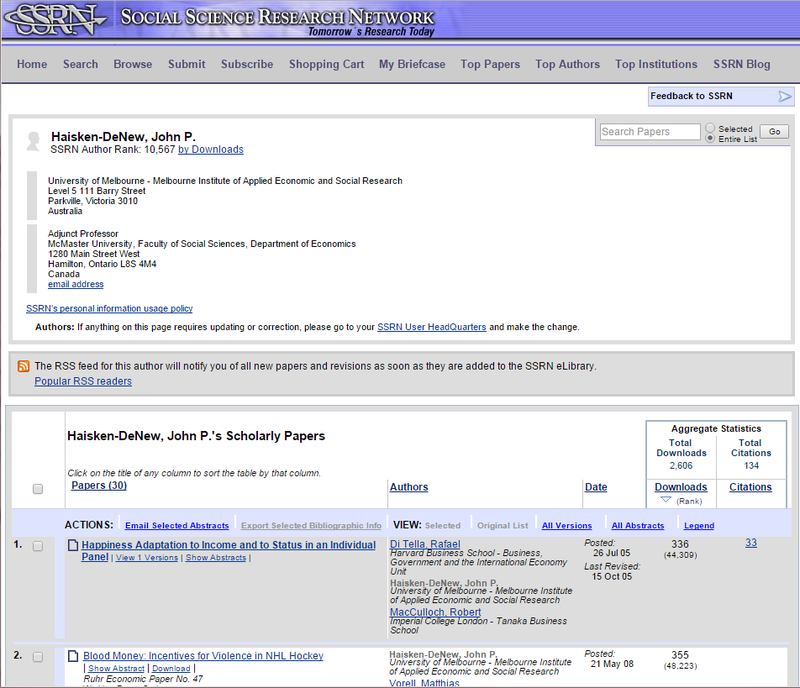 What is the Social Science Research Network (SSRN)? The Social Science Research Network (SSRN) is a website which aims to rapidly disseminate social science research and facilitate communication among researchers. It maintains a repository or 'eLibrary' of research for 24 social science disciplines or ‘research networks’, including economics, literature, information systems, law, management and sustainability. The eLibrary has two parts: an abstract database, and a full-text repository. You can upload your own papers to SSRN (and then others can download them for free), or choose to upload only abstracts and citations. SSRN encourages readers and authors to directly communicate with each other and discuss their research, and publishes detailed author contact information. Interact with other researchers in your field. Full-text publications uploaded to SSRN are indexed by Google Scholar. Prebble, J. (2013). Using the social science research network to aid and to promote research. Victoria University of Wellington Law Review, 44, 631. SSRN provides an ‘Author Home Page’ for every author with publications indexed in the SSRN eLibrary. You can access the home page for an author by clicking their name wherever it appears as a hyperlink in the SSRN system. To create, update or correct your SSRN Author Home Page go to the SSRN User HeadQuarters (HQ). SSRN User HQ accounts are free and you only need an email address and password to set one up. Access features only available for registered users. Screenshot of researcher's profile taken December 4 2014. Use of screenshot courtesy of SSRN.